UC Cooperative Extension advisors are on the front line and get the most interesting questions from our community. Someone brought some wasps into our office, and was worried they were invading her home, and wondered how to get rid of them. They were identified by the UC Davis Entomology Museum as black and yellow solitary mud dauber wasps, which are natural predators of spiders, and hence beneficial! Before you reach for that can of insecticide or heaven forbid, a blow torch to control spiders, talk to a UCCE advisor or Master Gardener in your county and read this blog for more information on managing them. 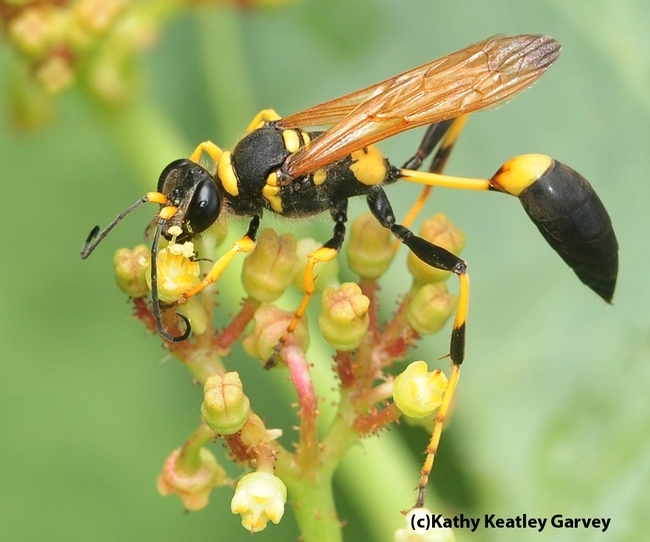 Yellow and black mud dauber wasps are predators of spiders but harmless to people. Adults are about 1-inch in length with true wasp waists! That mud you track into your house is nothing compared to what mud daubers can do — and what they do to spiders. Female mud daubers, or wasps, build mud nests for their young — and provision them with spiders. Where are the nests and what do they look like? 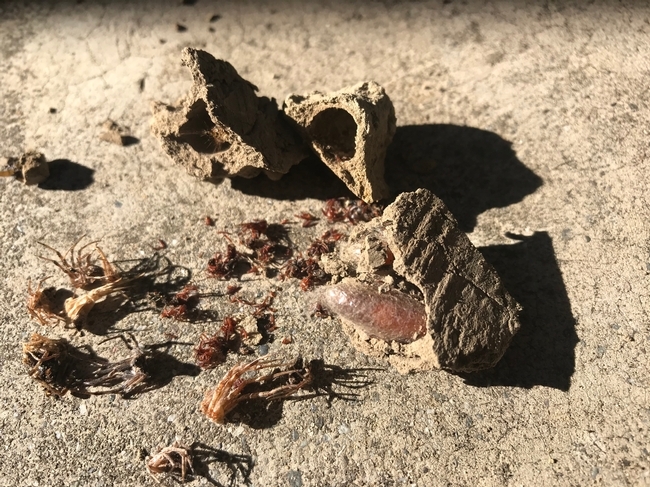 Female mud daubers, the architects, build those characteristic rectangular mud nests in protected areas of our homes, shops and garages, such as along eaves, walls or ceilings. Mud daubers are black and yellow solitary wasps (Sceliphron caementarium) that hunt spiders for their young. Another wasp, the blue mud wasp, reuses the black and yellow mud dauber wasp nests and primarily preys on black widow spiders. Mud dauber wasp nests with holes where adults have exited after completing their immature stages. Do mud daubers sting or bite? Mud daubers do not aggressively protect their nests. Unlike hornets and other social wasps, they are generally docile and rarely sting. No, mud daubers are harmless and actually beneficial. They prey on spiders, including black widows, a favorite prey. They pack each cell with up to 25 to 30 spiders for their young. With about 15 to 20 cells per nest, that's over 500 spiders eaten. This is good news, especially for those of us who fear black widow spiders. True, mud daubers can be a nuisance, as their mud nests look messy, but they are generally peaceful. How do they make their nests? Females construct their nests by gathering globs of mud in their mandibles (jaws) from a nearby source of wet dirt. They carry the mud to a protected nest site, where they construct a cell. Then they begin hunting for spiders to provision the cell for their young, and lay a single egg inside. When they capture a spider, they sting it, permanently paralyzing it. This preserves the spider until their larvae are ready to eat it. When the cell is full of spiders, the female mud dauber caps it with more mud and builds another cell next to it. After the egg hatches and the food gone, she pupates. When an adult emerges, it opens the cap, leaving holes behind in the nest for the next cycle. Mud daubers have a low reproductive rate, with about 15 to 20 eggs per female. Adults are active during the day during spring and summer with multiple generations per year. Queens overwinter in the cells in the larval stage. Adults sip nectar from flowers, where the male mud daubers are often found. Mud dauber wasps have good vision and use landmarks to locate nests and hunt spiders. They prefer protected areas where there are plenty of spiders. Sometimes you might see them going in and out of your house vents, hunting for spiders in your basement or attic. Mud dauber pupa (right) and cells packed with spiders, showing the importance of these wasps for providing natural spider control. How do mud daubers avoid being eaten by spiders? Some are able to land on webs without getting entangled, and pluck the web to simulate an insect in distress. When the spider rushes to capture its prey, it becomes a victim of the wasp's paralyzing sting. The wasp then carries it back to her mud nest. 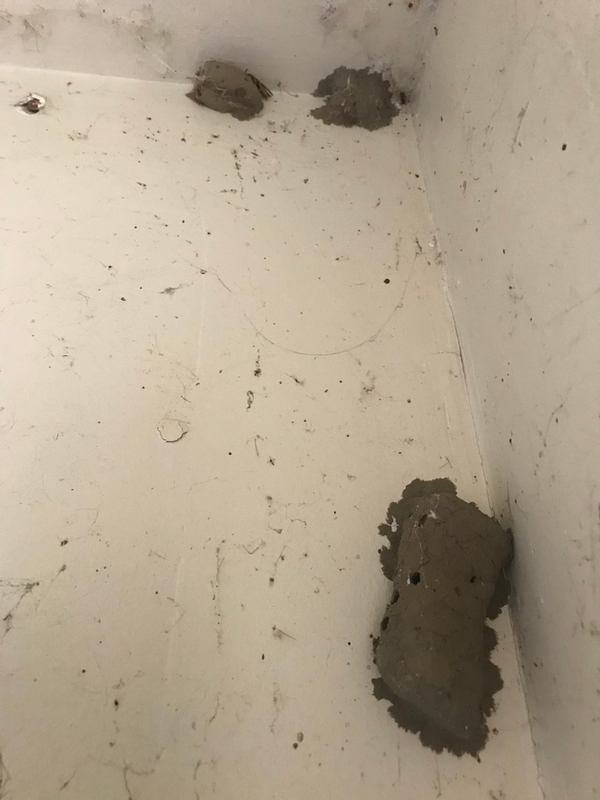 How do you get rid of mud dauber nests? Although mud daubers are considered beneficial, you can remove the nests by scraping them off with a paint scraper or a knife into a dust pan, and then tossing them or moving them somewhere else where you don't mind their activity. The best time to remove the nests is in the late evenings when wasps are not active, or during the wintertime when they are dormant. Do I have to worry about getting stung by a wasp or bit by a spider during nest removal? No, the spiders are paralyzed and the wasps are not aggressive. Mud daubers can sting, but only if directly handled or if they accidentally snag in your clothing. What's the best way to get rid of spiders? Overall, spiders are beneficial because they're predators and feed on pests like flies. Most spiders cannot harm people. Those that might injure people — for example, black widows — generally spend most of their time hidden under furniture or boxes, or in woodpiles, corners or crevices. The spiders that we commonly see out in the open during the day are not aggressive toward people. The brown recluse spider has occasionally been brought into California in household furnishings, and other items, but it does not reside here. Spiders enter houses and other structures through cracks and are also carried inside on plants, firewood and boxes. According to the UC IPM Spider Management Guidelines, the best approach for controlling spiders in and around your home is to remove hiding spots for secretive spiders such as black widows, and regularly brush or vacuum webs from windows, corners of rooms, storage areas, basements and other seldom used areas. This is effective because their soft bodies generally cannot survive this process. If you see a dust-covered web indoors, it's no doubt an old web that a spider is no longer using. Why should one protect mud dauber nests? Because mud daubers eat spiders, especially the cryptic black widows. In the process of cleaning spiders and webs, be sure to try protect those mud nests, because mud daubers naturally help control spiders in and around your home. 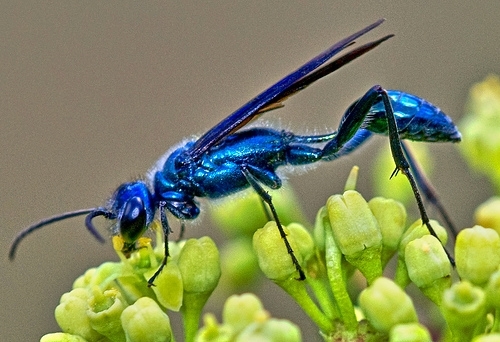 Blue mud wasp adults favor black widow spiders. Photo credit: University of Florida Extension. Wow! The photo of the spider corpses inside the mud dauber nests is amazing. Thanks for sharing in-depth information about this wasp.